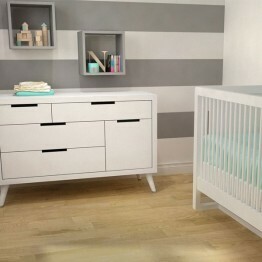 Brio baby furniture has a classic / contempo unisex design style which allows it to adapt to either a classical or moderate contemporary decor. Brio's classic / contempo unisex design style allows it to adapt to either a classical or moderate contemporary decor. Its creamy French white finish, rounded corners, bun feet, and wood knobs with real crystal inserts foster a comfortable, yet sophisticated ambiance. This collection's use of green components: formaldehyde-free glue & engineered wood, formaldehyde-free and lead-free paint and varnish, solid bamboo and bamboo veneer assure that it is not only "eco-friendly", but also user safe.